Yahoo adds voice search for Mobile Services | Tech for Lunch! Earlier this month, Yahoo! announced “Onesearch 2.0“. Onesearch is Yahoo’s search software for Internet connected mobile devices. The newly released version allows users to use voice commands to search the web. Now you can use your voice to get answers on your phone. With Yahoo! 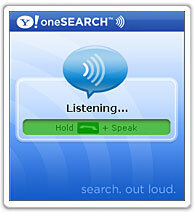 oneSearch™ with voice, it’s fast and easy to search for anything you need when you’re mobile. Just speak into your phone and get relevant and accurate results from Yahoo! oneSearch, an industry leading mobile search product. Onesearch is a pretty cool product because it allows you to find things faster than you normally would on your mobile phone. No need to browse to yahoo, search and then hope the results are relevant and well formatted for your phone. OneSearch runs directly on your mobile phone and lets you launch a search faster and returns relevant results that you can actually use. Yahoo has partnered with 29 mobile telephone service carriers, representing 600 million customers, since the first version of oneSearch launched in early 2007. The second-generation oneSearch software is free for download and installation to mobile telephones linked to the Internet.